As noted last week, the $500 Marvel Infinity Gauntlet Box Hardcover Slipcase Set was reported as out of stock at Diamond, ending its reign over these charts — but the Infinity Gauntlet trade paperback was once again the top reordered softcover, as well as being the top reordered item by dollars overall. The top hardcover was the second-place one from last week, DC's Green Lantern Earth One Vol. 1. It was released March 14. The top reordered comic book is one we've seen before in the advance reorder charts: Amazing Spider-Man #798, which went on sale today. This is the first time since we began running these charts last fall that the top reordered comic book was shipping the same week the reorder chart was released. The Artgerm variant of Mighty Thor #705 was the top reordered March comic book; it went on sale March 21. That's another one we saw in the advance reorder charts. Previously Image's Oblivion Song #1 had topped March-shipping reordered for three weeks; it still made the chart. Seventeen slots for Marvel in the Top 25 this week. 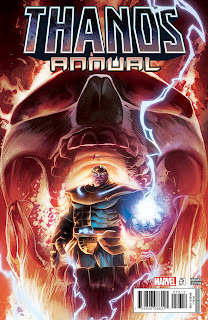 The top comic book in advance reorders was was the Deodato variant of Marvel's Thanos Annual #1, which goes on sale April 25. It's seen at the top of this post. The regular edition placed fifth. The 88-page J. Scott Campbell Danger Girl 20th Anniversary Edition from IDW probably qualifies as a trade paperback; if so, it was the top advance-reordered one. It goes on sale April 25. No hardcovers this time out in the chart.